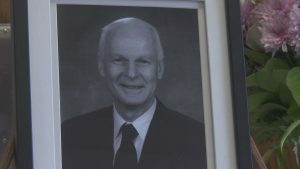 CENTRAL POINT, Ore. — Many gathered in Central Point Monday to remember the late Oregon Secretary of State Dennis Richardson as he makes his way up to the capitol for the last time. The veteran, lawyer and former Central Point representative was honored at the Church of Jesus Christ of Latter-day Saints Monday afternoon. Richardson was battling brain cancer and passed away on February 26th surrounded by friends and family. Richardson was a combat helicopter pilot in Vietnam, a lawyer and dedicated more than 19 years of his life to public service. When he was elected Secretary of State in 2016, he became the first Republican chosen for the position in more than 30 years. Richardson is survived by his wife, nine children and 31 grandchildren. A public funeral for the late secretary will be held at the Oregon State Capitol building in Salem on Wednesday at 2 p.m. in the House of Representatives chamber.